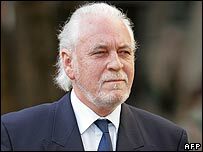 Procol Harum's former organ player has appeared in court to play the keyboard in a bid to prove he wrote part of one of the band's greatest hits. 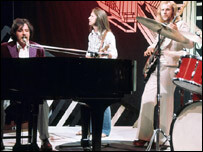 Matthew Fisher claims he wrote the distinctive organ melody in the 1967 single A Whiter Shade of Pale. For almost 40 years the number one song has been credited to the lead singer Gary Brooker and lyricist Keith Reid. Mr Fisher claims he was inspired by the classical composer Bach but says he also had "his own ideas in his head." Wearing a blue shirt with a blue tie, the 60-year-old sat at an organ set up in the corner of court room 56 at the Royal Courts of Justice in London. He was asked to explain "the process of his composition" which he did by playing a breakdown of the solo bar by bar. "This is meant to be a pop record, we didn't want anything too adventurous - too avant garde," he told the court. "I was trying to do something that sounded nice, that people would say `oh! that is a nice tune'," he said. The musician is claiming a backlog of royalties which were frozen six years ago as well as any future royalties. Iain Purvis QC, representing Mr Fisher, said: "The origin of this solo is the biggest bone of contention." During Mr Fisher's cross examination he told Mr Brooker's solicitor, Andrew Sutcliffe, he had always felt the credit he had been given for another Procol Harum track, Repent Walpurgis, had been a "token gesture". He claims the band gave him the credit "as a kind of compensation for not getting anything for A Whiter Shade of Pale". He was then asked whether he had signed a contract regarding royalties to that track and if he had known what he was doing. "I was just a young musician who wanted to make music and I didn't really think of contracts," he said. 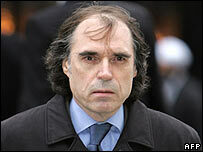 In 2003 Mr Fisher left the band as he told the court he had been "very unhappy". The court heard how at the time he had had a meeting with the other band members. In a statement, Mr Brooker claims Mr Fisher had dropped "a bombshell" when he brought up the subject of not getting a writing credit on the single. However Mr Fisher said this had not actually happened the way Mr Brooker had remembered it. "The account is very distorted," he said. "There had always been tensions between me and Gary," he added. He said he told Mr Brooker that "what he had done to him back in 1967 was very hurtful". He insists he had never actually made any reference to the song. In a statement on the band's website, Beyond the Pale, Mr Brooker said: "A Whiter Shade Of Pale was written by Keith Reid and me before Matthew even joined the band. "I am shocked and dismayed that after Matthew had worked with us quite happily over the course of 40 years without him once alleging that his role on A Whiter Shade of Pale was anything other than as a musician, it is only now that he claims he recalls writing part of the song. "People can draw their own conclusions from this." Mr Fisher is now a computer programmer, with Mr Brooker as the only original member still touring.